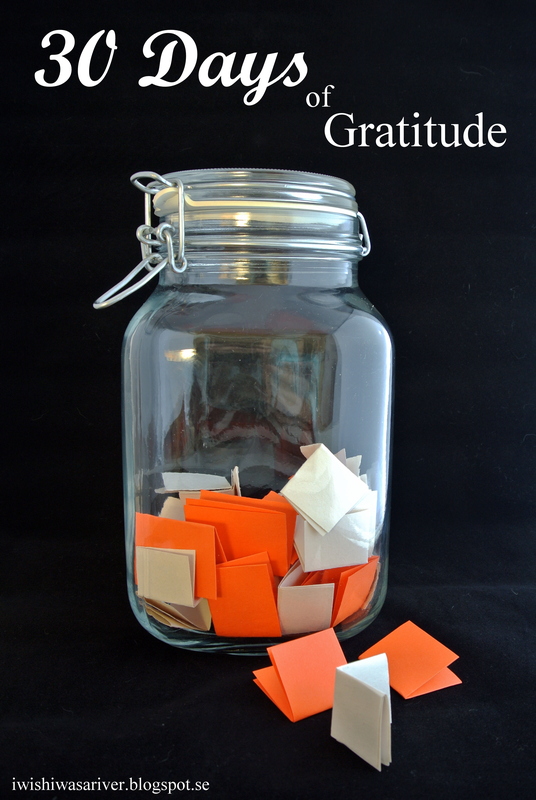 A nice thing to kick-off the year with is a Gratitude Jar. Then what’s a Gratitude Jar? The picture above might give you a hint, it is simply a jar where you collect small notes of things you are grateful for. All members of the family writes down one thing each and place it inside the jar. You repeat it every day for a certain amount of days. If you have small children you help them with the writing part. Some people do a jar for an entire year but I prefer a “30 Days of Gratitude”. You collect a ton of notes during an entire year and at the end of the year it is almost impossible to go through them all. Especially if you are a large family. The meaning of a Gratitude Jar, as I see it, is first of all to put the light on all the good stuff in your life. It’s easy to get caught up in a negative spin of complaining when the every day life sets in. Writing a note of gratitude every day and sharing it with your family will surely give you all a new perspective on things. Secondly, if you are still not convinced, imagine your collection of gratitude-notes at the end of the 30 days. If that doesn’t give you a hint of what’s precious in your life then what will?